1).Who is the Prime Minister of Canada? 2).Who is the winner of the Web Ratna Award 2014? 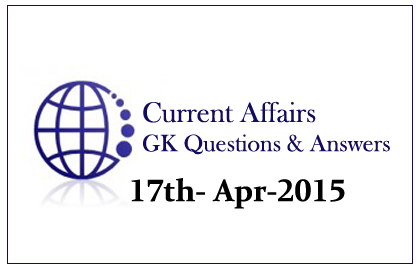 3).With which country India has held high level defense talks in April 2015? 4).Among the following which is the most profitable Indian Firm of 2014-15? 5).Satya Nadella, CEO of Microsoft has won the ________ award recently? 6).Who is the winner of the year’s reader poll for TIME Person of the year? 7).What is the name of the missile system, which Russia has decided to deliver to Iran? 8).Which of the following state has planned to form a task force to devise strategy to eliminate poverty? 9).Which of the following countries has decided to hold their first-ever joint military exercise? 10).Gharial Recovery Action Plan is a project of which of the following State?